The majority of rugby administrators have a corporate back ground bringing with them the ‘trickle down economics’ philosophy of the corporate world. This has led to many of them believing that all will be well if they only invest in top tier competitions. John O’Neill’s stewardship of the game is a classic example of this philosophy and junior rugby in Australia has continued to struggle under this model. By its very own initiatives, the ARU creates a financial divide which plays into its private school history maintaining tacit historical social segregation in the process – a divide which is there but never openly acknowledged. Rugby is a game only for those that can afford to play or watch it. For example the junior representative Rugby Gold Cup requires parents to make a considerable financial investment for their child to play to represent their region. Super Rugby is virtually the exclusive domain of Foxtel and its subscribers. The Shute Shield has disappeared off the ABC. 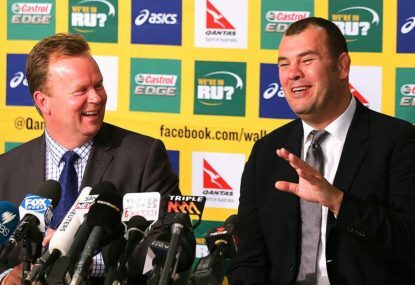 Clearly Michael Cheika – a multi lingual, emotionally intelligent son of Lebanese immigrants – has broken the traditional mould of the conservative rugby coach in Australia. In doing so he has created a wider opportunity for the game’s administration to do the same. The time has come for the ARU to break free of its conservatism and set a course to sell the game to all Australians. Funding junior representative rugby and providing free-to-air coverage of Super Rugby would be a good start. Symbolically, it will know that it has got there when Sydney University Alumni accept that taking the game, literally across the road, into Redfern – is a good thing. It has failed to this in more than 150 years of its history, but with a resurgent national side there is no better foundation to work from.